Grammys 2014 Recap | Ranting About Music! The Recording Academy of America celebrated itself and some of last year’s biggest music with the 56th annual Grammy awards last night. The Grammys are a bit odd for an industry award show; for an artist, they’re better as exposure than a prestigious award of merit. Like all of the institutional awards ceremonies, you know what you’re in for out of the gate: the award will have more disappointments than actual surprises, there’ll be some spectacle, a few laughs, and oh my God it’s going to take forever. One thing the Grammys gets absolutely right is putting the focus of the ceremony on the music more than the awards, simply because watching Keith Urban get in a guitar duel with Gary Clark Jr. will always be more fun than seeing Reba McEntire put a trophy for Best Country Solo Performance in someone’s hands. Few among this year’s gamut of performers truly bombed–doe-eyed country singer Hunter Hays in over his head came closest–but few went above and beyond, either. 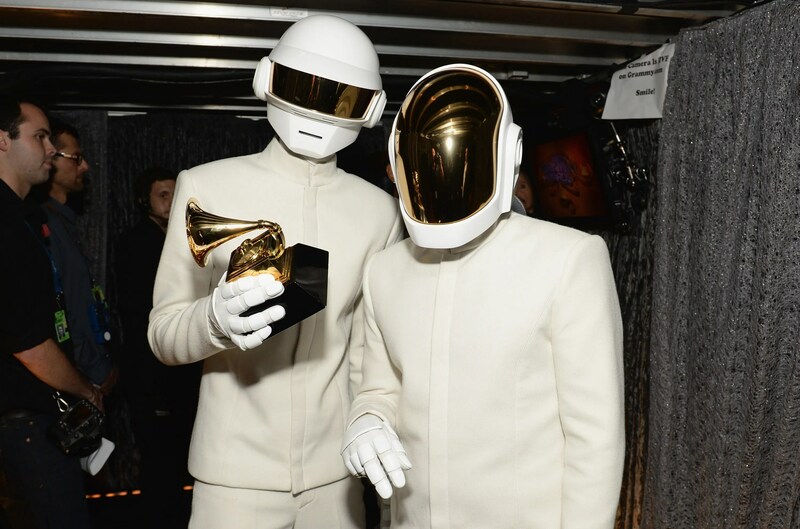 Daft Punk’s soul love letter performance with Nile Rodgers and Stevie Wonder is a lock for best of the night, while performance vets like Beyonce and Jay-Z, John Legend, Taylor Swift, and Metallica (with pianist Lang-Lang) put in solid if not showstopping work. It was an uphill battle for top 40 pop stars, though. Katy Perry’s Maleficent trailer rendition of “Dark Horse” was a bloated mess that felt much longer than its four minute run time. Robin Thicke’s collaboration with Chicago won the “WTF?” award, but little else. Pink’s solo take on “Try” while doing aerial silk moves was rightly awesome, but “Just Give Me a Reason” with Nate Ruess (sporting a new “I Wanna Be Freddie Mercury” mustache) had its normal sleepiness compounded by coming on the heels of an engaging performance. Lorde made an interesting extended intro to “Royals”, but her minimalist style made the actual song feel a bit flimsy; there was little variety to it. Maybe pushing the multi-layered minimalism to its logical conclusion could work. Speaking of which, Macklemore, Ryan Lewis, Mary Lambert, Queen Latifah, and Madonna (what?) finally removed all of the subtly from after school special “Same Love” by straight up marrying 30-something straight and gay couples in a heartwarming, IMPORTANT, and vaguely exploitative performance. There was one constant, though: you had to bring the energy. Nine Inch Nails, Queens of the Stone Age, Dave Grohl, and Lindsey Buckingham blew the roof off the ceremony with their closing (and unfairly cut short) medley that woke everyone up as the clock marched toward hour four. I was ready for the Kendrick Lamar/Imagine Dragons “m.A.A.d. city”/”Radioactive” mashup to go up like its own smoke machine, but it was a highlight due to Imagine Dragons playing like an actual rock band, and Kendrick going absolutely off on his verses. Let’s stay on Kendrick while we go to the actual awards themselves. Lamar went into the night with seven overall nominations (AOY, Best New Artist, multiple rap category nods, and two features), and came away entirely empty handed. It was a long shot for him to get Album of the Year, so I at least thought he would pick up the consolatory Best Rap Album award, but Macklemore even got that (I know the Grammys are more generous to pop-rap, but The Heist wasn’t even the best pop-rap album nominated). That an artist as culturally admired and critically respected as Kendrick Lamar got nothing would be a shock in most other mediums, but for the Grammys, it’s nothing but business as always. That, I think, is why the Grammys are so frustrating. The academy has made conspicuous attempts to modernize in recent years from hashtaging everything to throwing in more pop performers to tossing more nominations at blog/magazine favorites, but underneath it all, they’re still the stuffy old white guys everyone lampoons them for. Look at the rock categories: Paul McCartney, Black Sabbath, and Led Zeppelin competed against youngsters like Neil Young, The Rolling Stones, and David Bowie, with Imagine Dragons, Queens of the Stone Age, and Muse in there for the kids. Macklemore’s sweep of the rap categories is shocking, until you remember that the guy’s so safe, that your high school guidance counselor would want you to be friends with him. That said, this year’s Big Three awards, the Song/Record/Album of the Year went to solid choices: Song and Record went to the best in category (“Royals” and “Get Lucky”, respectively), and while Daft Punk wasn’t my first choice for album of the year, it’s an understandable choice. Random Access Memories was a wonderful listen, but it was also steeped in wide-eyed idealization for the music of the 60s and 70s with immaculate production and emphasis on the quality of the musicians and the authenticity (read: as few synthesizers as possible) of the music. All of which are also true of past winners Mumford and Sons and Adele, who were also favorites in the race when they won. So, there it is, another Grammys. We rolled our eyes, we sneered, we liked some of it, we feigned shock, and we’ll watch it again next year. PS, here’s the quick ‘n dirty of who won in the categories I guessed. Four out of nine, yikes! This entry was posted in "Thoughts" and tagged 2014, Daft Punk, grammys, Lorde, Macklemore, music, pop music. Bookmark the permalink.